What Camera system should I buy??? Every pro or semi-pro photographer has been asked this time and time again. My somewhat vague answer is always – what are the main criteria you are looking for in a camera? Do you want a camera that has the best image quality, is the smallest and lightest, or one that is cheap? Usually, they say all of the above and I say GOOD LUCK WITH THAT. Just as in life, you can’t have it all, but you can get pretty close if you do your homework. Luckily, there are many camera options out there. Depending on your needs, one is sure to be right for you (maybe with a couple of trade offs). 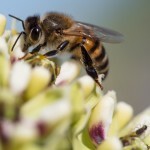 To find out which one it is you first should understand and prioritize what is most important to you in a camera. You’ll get to listen to an in depth comparison of the different types of cameras and see many graphical representations of the cameras’ pros and cons in addition to sample images taken in similar settings so that you can compare image quality. The video is great for people who just want to listen, but if you are a glutton for punishment and want to read everything – check out the slides and bullet points below, which give a synopsis of the video. I gave this presentation in front of a bunch of food bloggers, so feel free to check out some food images from my food portfolio. I’ve been shooting with all sorts of cameras for the last 10 years. I’ve owned nearly every camera system out there, and I’m here to share my knowledge with you. I’m here to tell you that you can’t have it all with camera features, but you can get most of what you want in a camera, but there are tradeoffs. As the Venn diagram above show, the best image quality comes from expensive cameras that are large in size. The cheapest cameras usually only produce OK image quality. Similarly, if you want a really small camera, the image quality isn’t going to be the best and it may or may not be cheap. There are overlaps where you can get some or all of these features in a single camera, but we’ll get into that later. 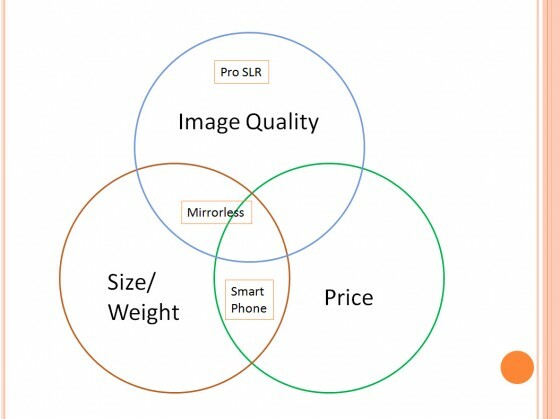 In addition, there are many variables to consider when purchasing a camera besides image quality, size, and price. And similarly, if you get some of the features you want you will have to skimp out on others. I’ve broken out 5 distinct categories of cameras and placed them in a spectrum. On the left side of the spectrum we have cameras that are small, light weight, convenient, cheap, but produce the lowest image quality. On the far right we have cameras that have the best image quality, but are the most expensive, least convenient, least easy to use, and heavy. There are also 2 categories that don’t really fit on the spectrum neatly, namely toy cameras and the Lytro camera. Toy cameras are intentionally cheap plastic cameras with a lot of style, and photos with either heavy vingettes, light leaks, and cross processed film – you know, real life Instagram. 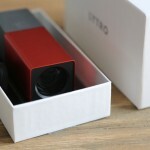 The Lytro is a 3D camera that produces lo-fi “living pictures” that are really cool, but not very usable for prints. 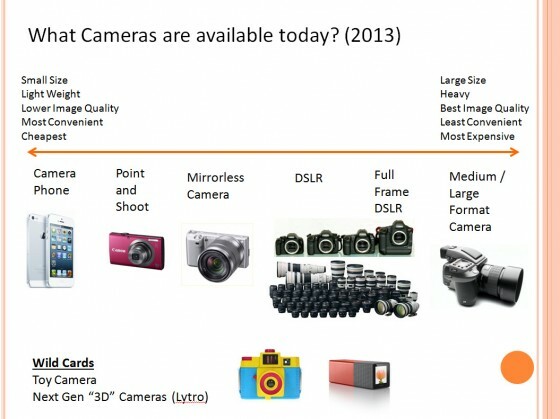 For the purposes of this post, I’m generalizing and saying there are 3 main categories of cameras available today. Camera phones and point and shoot cameras are lumped together, mirrorless cameras and crop sensor DSLRs are in another grouping, and full frame DSLRs are on top of the digital camera hierarchy. Even though medium format cameras are another option, these are very inconvenient to use and out of most people’s price range, so we’ll exclude them. Why group camera phones and point and shoots together? Point and shoot sales have fallen rapidly in the last few years, ever since the iPhone camera became “good enough” for most people. 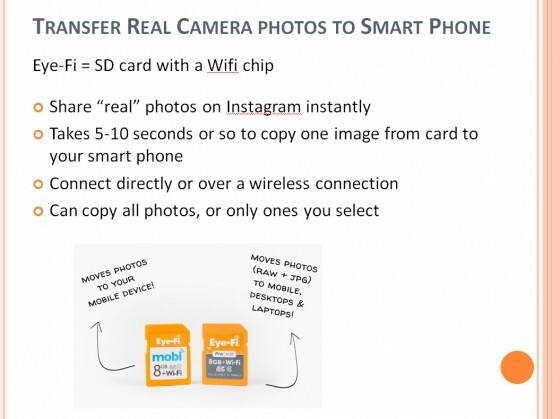 Also, the incremental image improvement from a point and shoot is negated by the connectivity advantages of a smartphone that allow you to post photos almost instantly (not to mention you always carry around a smart phone no matter what). 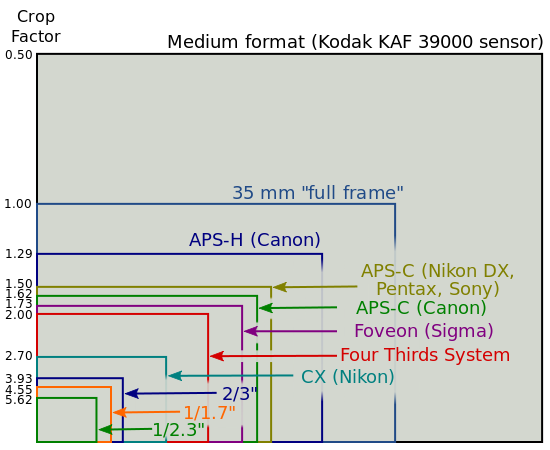 Mirrorless cameras and regular (crop sensor) DSLRs are grouped together because many of them share the same sensors, and therefor the same image quality. Mirrorless cameras are physically smaller because of the lack of a mirror between the lens and the sensor. There are some mirrorless systems, such as the micro 43rds standard (made by Olympus and Panasonic) that have smaller sensors – they have the additional advantage of very small lenses, but the image quality is not quite as outstanding as the crop sensor DSLRs and mirrorless cameras from the likes of Sony, Fuji, and Canon. All mirrorless camera bodies tend to be small, but those mirrorless cameras with DSLR sized sensors tend to have lenses that are almost the same size as crop DSLR lenses. What separates the different classes of cameras? The biggest determining factor in digital camera image quality is the size of the image sensor. In general, the more light a pixel on an image sensor can capture, the better the image. 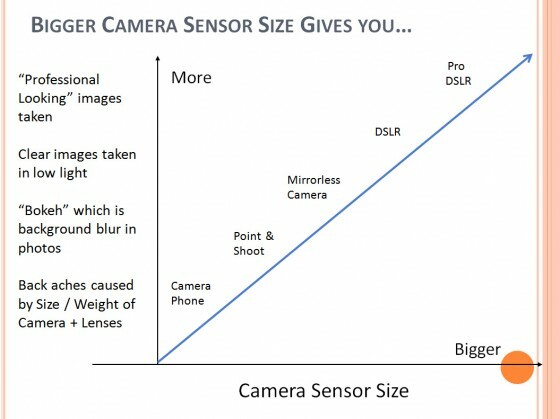 By the same logic, the bigger the sensor, the bigger your pixels are and the more light each pixel can capture. 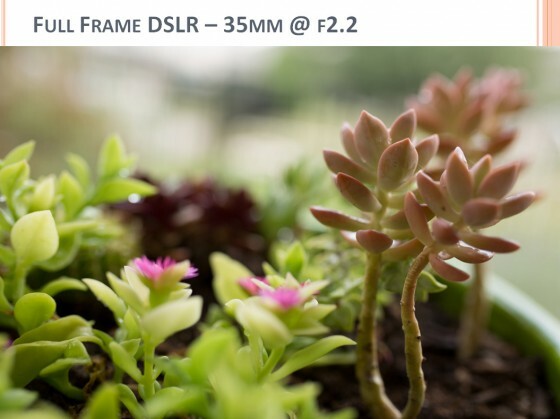 Therefore, the bigger a camera sensor becomes, the more professional looking images you can capture, the clearer the images taken in low light become, and the amount of bokeh in your pictures (beautiful out of focus / blurredareas) increases. However, you’ll also experience more back aches caused by lugging around heavy cameras and lenses. The bigger a camera is too, the less likely you are to carry it around with you everywhere. The best camera in the world is useless if you left it at home. It’s often said today that the best camera is the one that you have with you. A 35mm full frame sensor (best image quality of the cameras we are analyzing) is 2.5 times bigger than a regular DSLR (APS-C) sensor, 4 times bigger than a micro Four Thirds mirrorless sensor, and more than 55 times bigger than an iPhone5 camera sensor The terminology “full frame” references the size of a single35mm film frame… you know those things you used to buy from Kodak? Typically they had 24 or 36 frames per roll of film. At the same settings with an equivalent lens (35mm equi @ f2.2), the image captured on an APS-C sized sensor produces a nice image, but it’s evident that the amount of “bokeh” is less than in the ful lframe image. More of the foreground flowers are in focus and background is more distinguishable in the image. With a sensor size that’s 55 times smaller than a full frame sensor, this iPhone image does not leave anything to the imagination as to what is in the the background. You can clearly see a fence, houses, and a storm drain. In the APS-C and full frame images, most of these details were completely blown out. 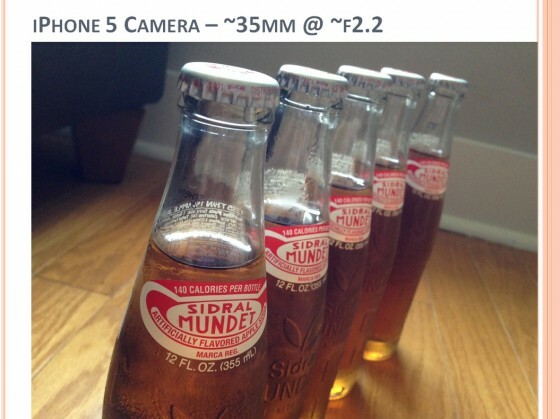 In this iPhone5 image you can see the lack of much bokeh at all. The first 3-4 labels are legible in the frame and there are some color / noise issues going on. 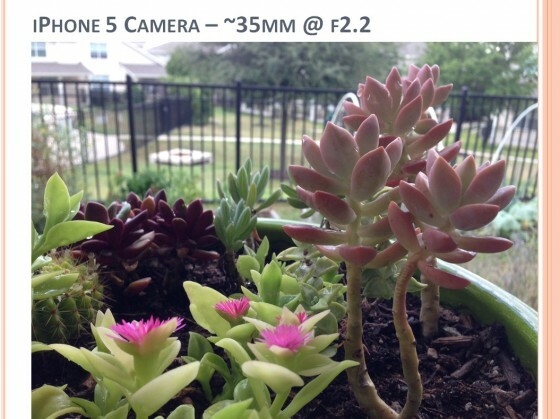 The Micro 43 mirrorless image is looking quite pro compared to the iPhone – then again the sensor is much larger. 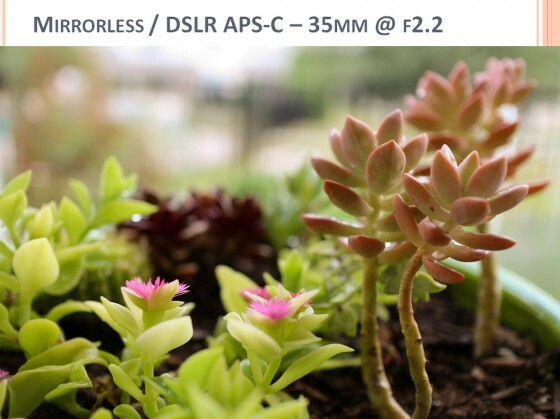 Mirrorless cameras (especially Micro 43rds) provide near pro level quality in a tiny package. The lenses for m43 also tend to be 2-3 times smaller than an equivalent full frame lens. 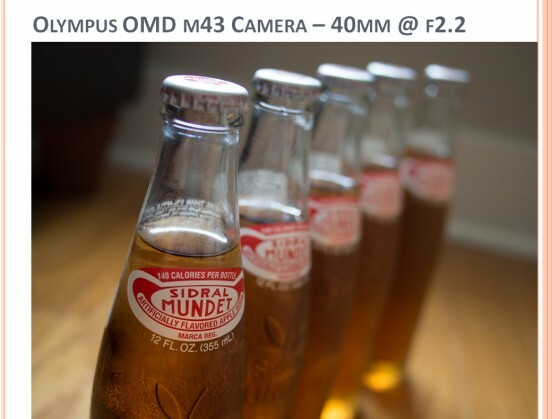 For more info on the size differences between full frame and m43 – read my article comparing the Olympus OMD EM5 vs the Canon 5dmkIII and their portrait lenses. An APS-C sensor can take the bokeh to yet another level – compared with the m43 sensor image, you can see a bit more blur. 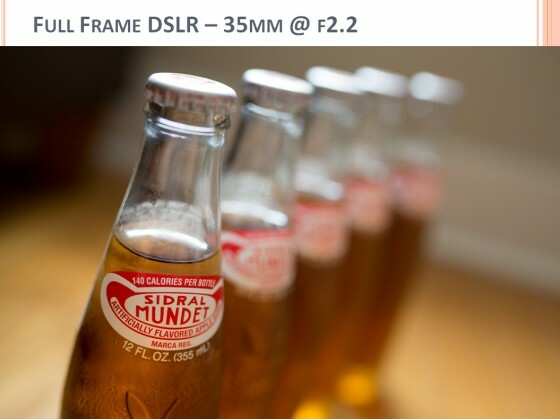 The 2nd bottle in this photo is completely blurred out. Finally, shooting with the full frame camera + lens provides the most amount of bokeh. Look at the amount of blur on the last bottle – you get these beautiful large round bokeh spheres anywhere there is a single point of light. Getting back to our Venn Diagram from earlier, This is my assessment of where the cameras fall into place. Pro DSLRs are definitely the best in image quality but are inconvenient to carry and expensive. Mirrorless cameras are a compromise, but they are really light compared to a DSLR. Smart phones are great for the size and price (free), but the image quality is a bit lacking. If I had to throw point and shoot in here, it would probably be between the mirrorless and smart phone entries. The image quality is better than a smart phone, but it’s still something you need to carry around. I would just go for a mirrorless camera since it’s not much bigger at all. The last thing I want to bring up was that many high quality cameras are getting wifi functionality that allows you to upload your more pro looking photos to your smartphone, which can then be used for editing and posting to Instagram. If your camera is not wifi capable, there is also a wifi enabled SD card called Eye-Fi that will connect to your smartphone or tablet directly or over an existing wifi connection. 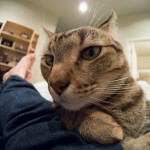 When Eye-Fi works, it’s awesome. However, it is sometimes a pain to set up. There are additional slides on lighting and lenses in the video, but I’ll just let you watch the last 5 minutes of the video to learn about those. Well, that’s about it – a very basic comparison of the different types of cameras available today. Of course, the camera situation is constantly changing so this comparison will likely be different next year. In general, cameras in all classes get better and better each year. 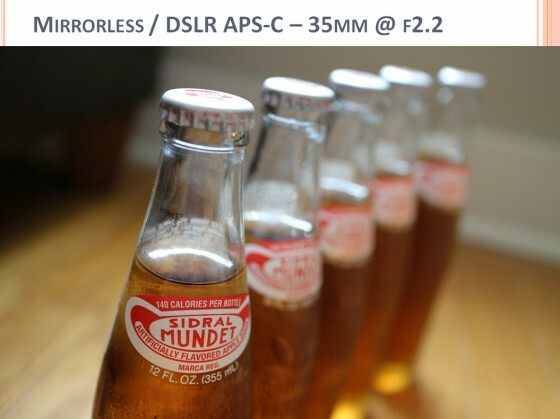 I expect in 2014, focus speed and responsiveness of smaller cameras will come closer to the pro DSLR range. Camera phones will continue to get better (probably killing off point and shoots even further). What did you think of the comparison? 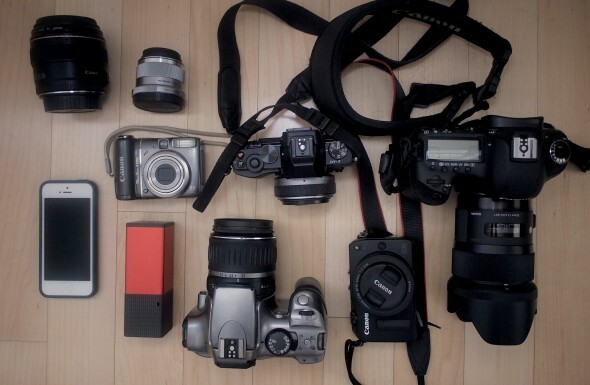 What camera is right for you? 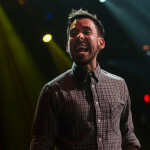 Love that you posted this! I was so kicking myself for missing your presentation at Photo Camp. The comparison photos are SO helpful for really getting a feel for the differences in image quality. I assume since you say the mirrorless camera lenses are smaller that I couldn’t use a DSLR lens on a mirrorless? Also, how are they as far as speed? One of my biggest pet peeves with my point-and-shoot is the painful delay between clicking the shutter and snagging the shot. That’s actually one reason I not-infrequently choose my iPhone camera over my point-and-shoot with the higher-quality lens. Totally agree with your analysis and conclusions. I’m a mirror less user (micro4/3) and find the balance between image quality, portability and ease of use the perfect combination! 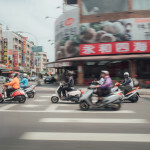 Pingback: Photography Camp Retrospective | bake me away! you can use a DSLR lens on a mirrorless camera if it’s the same brand and you have an adapter. So, I can use a Canon DSLR lens on my Canon mirrorless camera, but it ends up looking really funny b/c the DSLR lens looks huge on the mirrorless camera. Your S1000 has one of the larger sensors for a point and shoot camera, but a mirrorless m43 or APS-C will have much better image quality. 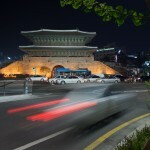 Speed on mirrorless cameras varies, but usually the focus speed on them vs a point and shoot is faster. my m43 camera is particularly speedy. However, my Canon mirrorless camera focus is kind of slow. Your mileage may vary. You can use a Canon DSLR lens on my Canon mirrorless camera, but it ends up looking really funny b/c the DSLR lens looks huge on the mirrorless camera. The comparison photos are SO helpful for really getting a feel for the differences in image quality. I assume since you say the mirrorless camera lenses are smaller that I couldn’t use a DSLR lens on a mirrorless? Also, how are they as far as speed? One of my biggest pet peeves with my point-and-shoot is the painful delay between clicking the shutter and snagging the shot.